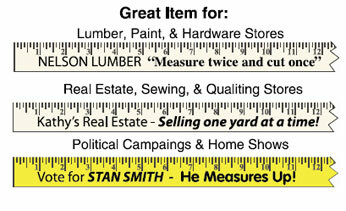 Yardsticks | Anthony & Co.
Low Prices, Fast Service & High Quality - We do it the way you like it! Your advertising message BOLD and PROMINENT on both sides with English scale in BLACK. • Imprint Colors: Black, red, blue, light blue, dark green, light green, purple, teal, or maroon. • Plate Charge: A one time plate charge of $37.50 (V). • Change of Imprint on Reverse: $25.00 (V). • Imprint Size: 35" x 1/2"
• For Custom Color of Ink: $43.75 (V) per order. • Drilling Holes: $.04 (U) Each, $18.75 (V) minimum. • Metric Scale on One Side and English Scale on Reverse: $50.00 (V) per order. • Yardsticks cut to specific length: $.038 (V) each. • Leather Strap: $.50 (V) each. • Snow Guage: $125.00 (V) each. Includes plate charge. within the order is a one time charge of $25.00 (V) Each. OUR BEST SELLER - An excellent yardstick in the popular price range. Ad message - RED, BLUE, BLACK or GREEN. 1/4" x 1-1/8" x 36"
Coated with clear lacquer for that expensive look. Ad message—RED, BLUE, BLACK or GREEN. Coated with high-gloss lacquer in LIGHT BLUE, MEDIUM BLUE, YELLOW, RED or KELLY GREEN. Shipped in assorted or single colors. Ad message—BLACK. Coated with high-gloss lacquer in FLUORESCENT ORANGE, FLUORESCENT YELLOW, and FLUORESCENT PINK. A natural yardstick with a big impact. This heavy duty yardstick with a big imprint area will get your message seen. Price includes drilled hole and printed with guage and ad message in the same color. 1/4" x 1-1/2" x 36"
Warning! Your browser is no longer supported. Please upgrade to a newer version of Internet Explorer, Firefox, Opera, Safari, or Chrome. Copyright © 1998-2019 Anthony & Co., Inc. All rights reserved. Web Design by Middle Ear Media.